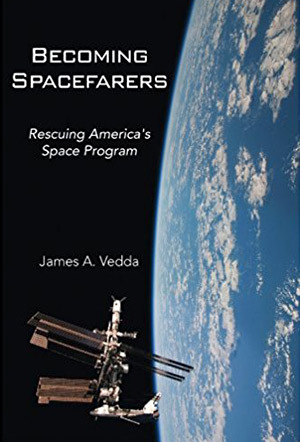 At the present time, when the future of the United States space program is in a state of flux, as the Shuttle program ended and these magnificent spacecraft became museum pieces, Dr. James A. Vedda presents an interesting and doable blueprint for future space policy. Space development is a high ticket, long term commitment. He makes a very strong case for the fact that we are at the turning point in exploration and development and that we need a new approach to avoid the bad mistakes we made in the past. To accomplish this, we have to set achievable goals now that will take space policy into the future. Dr. Vedda, currently a senior policy analyst for a government contractor in Washington, D.C., is very familiar and knowledgeable about space matters. He earned his PhD at the University of Florida and his masters in space, technology and public policy from George Washington University. He was a founding faculty member of the Space Studies Department (this writer’s alma mater) at the University of North Dakota, published numerous books and articles, and served on many committees involved in space policy. As an avid space enthusiast, he deplores the current lack of a forward-looking U.S. policy on space. In his book, Becoming Spacefarers: Rescuing America’s Space Program, he provides an in-depth analysis of where space policy has been, what did not work in the past, and offers suggestions as to how to get space policy back on track to return the U.S. to its place as a leader of space exploration. He does not believe that there is enough depth on the part of decision makers beyond the immediate needs of the space industry. By examining early achievements, Dr. Vedda illustrates how Apollo got us to the Moon but left us without a coherent policy to go further. He reviews and compares the various presidential space policy programs and finds that they were independent of any other program that was proposed by earlier presidents, thus losing the opportunities to expand on our successes and grow as technology and science grew. The Space Shuttle program should not have been a stand-alone objective, but a means to learn and grow for the future. He does a thorough study of the growth of the shipping and overland cargo industries which began amidst greed and disarray and grew into the industries that we know through the cooperation of the government and private sector. He sees this as a way space initiatives can grow as well. Dr. Vedda’s prescription for the future is simple—we have to take baby steps to achieve our long range goals, first getting a solid infrastructure in place that will cover all players in the field. This infrastructure would be developed under a sound government policy that takes into consideration the contributions of the private sector as well. U.S. space programs should not be destination driven. Rather, our programs will have basis for continuity and advancement. He says that if the policy is purpose driven, we can use current technology to assist in activities in the near term. Let the private sector provide the logistics and routine operations while NASA and other government entities provide the science and technology that they excel at. Currently, we are infant spacefarers and as such have a lot to learn before we can live, work and explore in space. He envisions three stages to space development: 1) Training ground: learning how and what we have to accomplish in space; 2) Industrial park: working in our space neighborhood which is cis-lunar space (the area of space that encompasses the Earth and the Moon) and possibly include asteroids, and; 3) Settlement: only after we have become comfortable with the science and technology to live off the Earth. Dr. Vedda’s proposal is sound and achievable. By looking at the smaller picture, we can prepare thoroughly for reaching our goals in the future. Space has been there for far longer than man has and will be out there for a very long time. If we take our time to do our development correctly, with the proper and supportive policies of the government, we can learn to work and live in space. I thoroughly recommend this book to all interested in seeing space development become a sustaining force in our lives. The book is important especially for our young adults because it provides encouragement for them to pursue careers in science and technology knowing that there is potential for future space development.